Hotellin uima-allas alue oli erityisesti meidän mieleemme. Ruoka oli monipuolista ja hyvää. Nice hotel. Helpful staff. Good location. Great breakfast buffet. I would stay there again. 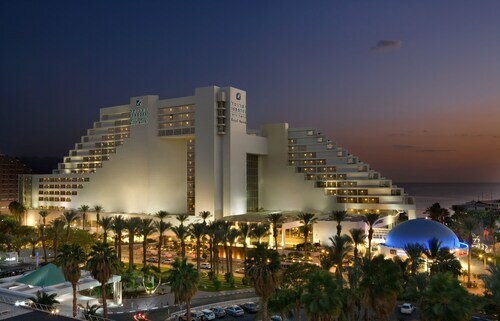 This family-friendly Eilat hotel is located on the boardwalk, just steps away from Mifrats Beach and Harbor Bridge. Dolphin Reef is 2.7 mi (4.3 km) away. 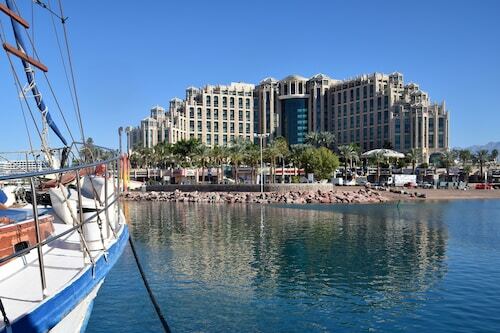 This family-friendly Eilat hotel is within a 10-minute walk of Eilat Marina, Spiral Park and Ice Mall. Dolphin Reef is 2.7 mi (4.4 km) away. Ruhig, sauber und für die Jahreszeit preiswert. Kurze Wege ins Zentrum. Freundlich und hilfsbereit. Zu den anderen Wohneinheiten kann ich nichts sagen. Wir waren Familie mit 2 Kindern. Good location next to central bus station, 20 minutes walk from the real heart of the town. Hotel is clean. 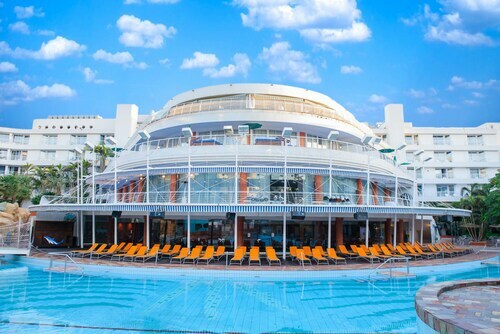 Good free wifi, clean pool on roof. Biscuits and tea/coffee available whole day around. Personnel nice and helpful. Reasonably priced. Fully recommend! Good central location, with rooms overlooking the lagoon, given the proximity of the airport they had done as much as they could to reduce the runway noise. A great breakfast buffet selection and a lovely pool with lots of loungers and hammocks. 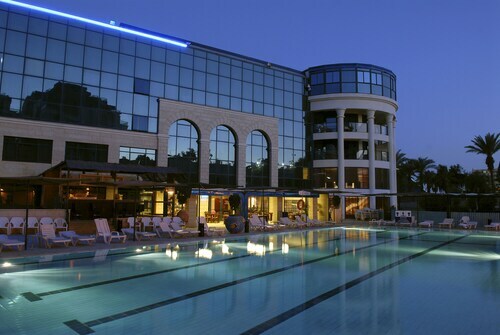 This family-friendly Eilat hotel is located near the beach, within a 5-minute walk of Ice Space and Spiral Park. Dolphin Reef is 2.5 mi (3.9 km) away. Sehr freundliches Personal. Alles sehr sauber. Sehr reichhaltiges Morgenbuffet. 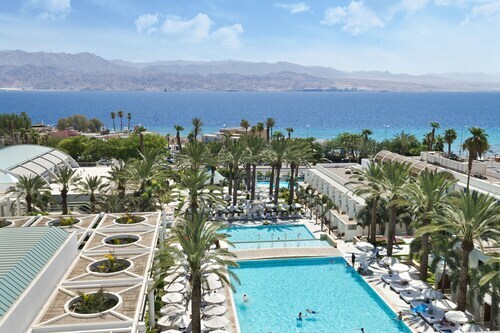 So, you're considering a trip to Eilat? If you want to find accommodation that's within a stone's throw of the sights, you can enter your holiday dates and then use the filters next to your hotel search results to find somewhere to stay near the area's attractions. 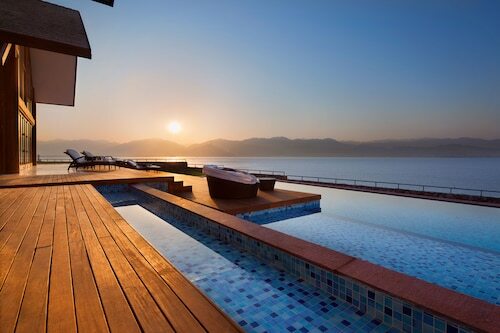 You can choose among 144 Eilat hotels and accommodation options to find a place you'd like to stay. 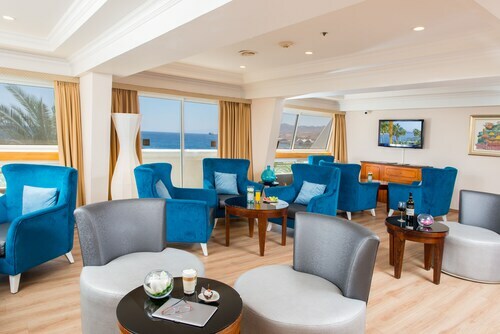 When you're deciding where you want to stay in Eilat, you'll be able to quickly and easily search ebookers for hotels offering services such as high-speed Internet, free airport transport or a swimming pool. 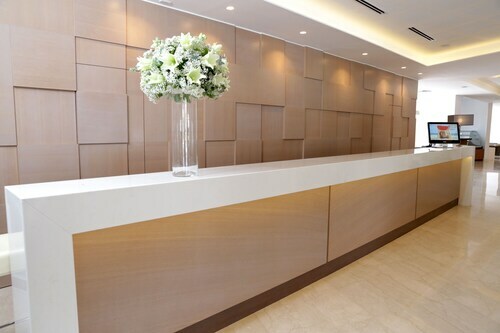 You can use the filters to narrow down your search for accommodation, so you can get the services that are important to you, such as air conditioning or an in-room kitchen. When making plans for your trip to Eilat, you can also use ebookers to find a convenient flight into Eilat (ETH) Airport. You can narrow down your search by number of stops, airline or time of departure to find the one that works best for you. When is the Best Time to Explore Eilat? If you're wondering when is the best time of year to travel to Eilat, you may find this information about seasonal weather helpful when planning your trip. The warmest months in Eilat are typically August and July, whereas the coldest months are usually January and February. The months with the most rain are March and February, whereas March and February have the least. From January to March, the average daytime temperature is 28°C and at night it is 9°C. Seasonal average rainfall is 0 mm. If you visit between April and June, you can expect an average temp of 40°C during the day and 15°C at night. Average rainfall during this season is 0 mm. The daytime average temp from July to September is 40°C and the nighttime average is 22°C. Average precipitation for this season is 0 mm. Average annual rainfall in Eilat is 0 mm. Ravintolan toiminta kaipaisi nopeaa parannusta. Ruoka ensiluokkaista, mutta henkilökunnan tominta vaatisi nopeaaa parantamista. Suurimmalle osalle keskinäinen keskustelu tärkeämpää kuin asiakaspalvelu. Eivät tervehdi, eivätkä sano sanaakaan noutaessaan astioita pöydästä, Vievät astiat, vaikka ne olisivat vielä puolillaan ruokaa. Henkilökunnan kielitaito myös erittäin puutteellista. Suuri osa ei osannut englantia. Good central location and excellent value for money.Will use again next year if a similar deal is available. + Die Lage war top und der Swimmingpool auch. - Das Personal wirkte eher unmotiviert und müd (einzelne im Restaurant waren nett). Aber die anderen Angestellten wirkten eher unglücklich. Das Preis / Leistung Verhältnis stimmt leider nicht überein. Die Sauberkeit lässt zu wünschen übrig und das Personal spricht nur schlecht English bzw. ist nicht kompetent. Terrace is big, rich selection of breakfast. Noisy environment. Vähän ränsistynyt kalustus, mutta melko siisti ja asiallinen. Hyvä sijainti ja rauhallinen.